With the passage of time it had not occured to me that of the lifeboats involved in the Rohilla tragedy might still exist today. Of the six lifeboats involved in efforts to rescue people stranded aboard the wreckage, the Whitby Number 2 lifeboat, John Fielden was perhaps the saddest to have been lost itself. In such an extraordinary feat the John Fielden was hauled by hand over the pier wall before being man handled over the scar before she could be launched into the boiling surf. This amazing feat was not the only one witnessed at the time and one cannot fail to be amazed by yet another arduous task plan. It was decided to take the Upgang lifeboat William Riley of Birmingham & Leamington six miles over land to a point on top of the cliffs adjacent to what remained of the once proud ship. The lifeboat was lowered down a 200 ft perpendicular cliff by hand in a manoeuvre that would be almost un - thought of today, even with today's technological advances. Sadly the sea conditions were too rough for the lifeboat to launched straight away, to the severe disappointment to all those present. The lifeboat was taken into service by the RNLI on the 11th June 1909 and her official number became “ON 594” she was placed on trials until the 18th June 1909 when she was allocated to the Upgang Lifeboat Station. The former lifeboat did not have a very illustrious record at the Upgang Station with the William Riley having only been launched on service twice. The station closed on the 13th November 1919 with the lifeboat transferred to the Whitby station. 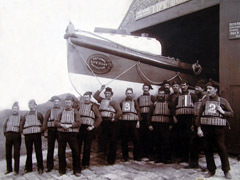 The lifeboat was held at the station until the 27th May 1931 when she was effectively decommissioned. The lifeboat holds a history of being launched on service twice at Upgang and a further thirty one times at Whitby, saving no fewer than 10 lives. The William Riley was found on an internet auction website in 2005 and when visited it was found in an almost derelict state. It was recovered and returned to Whitby to a trust set up to oversee its eventual restoration. 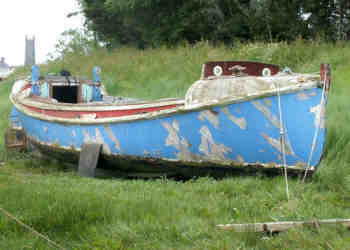 In 2008 the former lifeboat was unvieled by Mr. and Mrs. Goodwill our local MP, to the public after a complete resoration. The day was marred by poor weather, but the boat still looked wonderful, it was launched later in the day for its first trial. The boat recently completed its first major fundraising venture recreating the journey undertaken by the Tynemouth motor lifeboat Henry Vernon in 1914. It was an adventurous challenge carried out in challenging conditions. I was at Tyneside to see the boat leave on its first leg to Sunderland and was of course part of the small flotilla escorting the boat into Whitby harbour.